In 2018 I began a continuing education quest where I held myself to a strict goal of earning one new digital marketing certification per week. As I begin year two, I wanted to start sharing my progress on my own website rather than only posting these to my Linkedin. While there is certainly no shortage of digital marketing certifications and course material out there, my best advice for following in my footsteps would be to skim the list below and take the lessons which are most helpful to your situation or goals. I have been a digital marketer for the past 12 years, and my hands on experience greatly helped me get through courses quickly. I also encourage you to read the what I learned section of this post for a few helpful tips. NOTE: The course descriptions below were all primarily linkedin posts, so all of the links are shortened as if it was a social share. Nothing mentioned in my certification quest is an affiliate link. 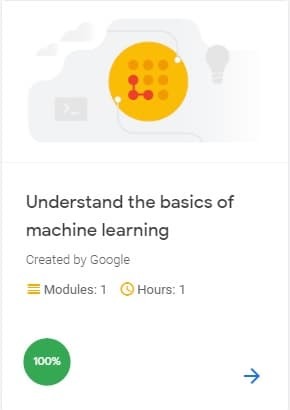 This week was a quick course from Google’s new Digital Garage called “Understand the Basics of Machine Learning.” Machine learning powers organic search engine rankings, so anything I can do to understand it better is going to be part of my weekly learning. This was an easy course that did not get into any of the technical details. It will help you better understand what machine learning is and is not. I recommend anyone interested in SEO take a few minutes to go through this one. You can take this course for free here. 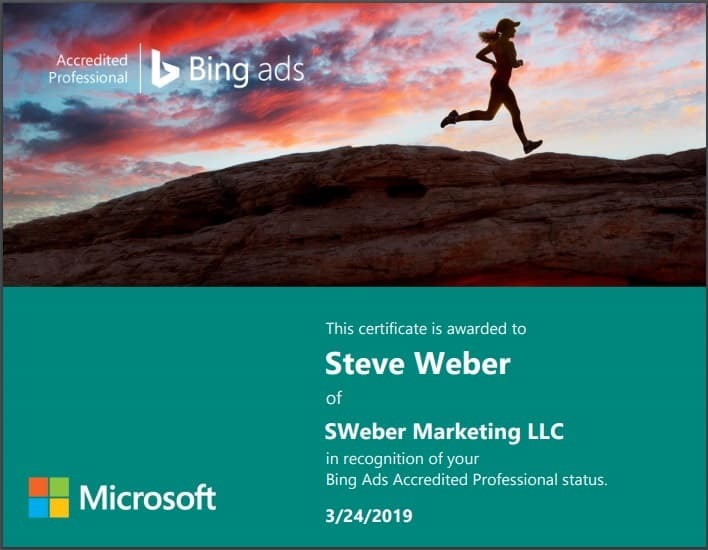 This week was a renewal of the Bing Ads Accredited Professional Certification. 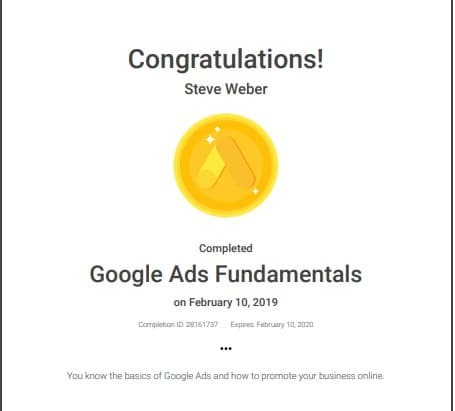 Similar to the Google Ads certification, this is the exam and course you need to pass in order to become an Accredited Bing Ads pro. The course covers the fundamentals of the Bing Ads platform. I will admit that this exam took me a few more attempts than it did in previous years, so it is either getting more difficult or I am using Bing Ads less than ever. I would just account for some extra study time this year. You can earn this certificate for free here. 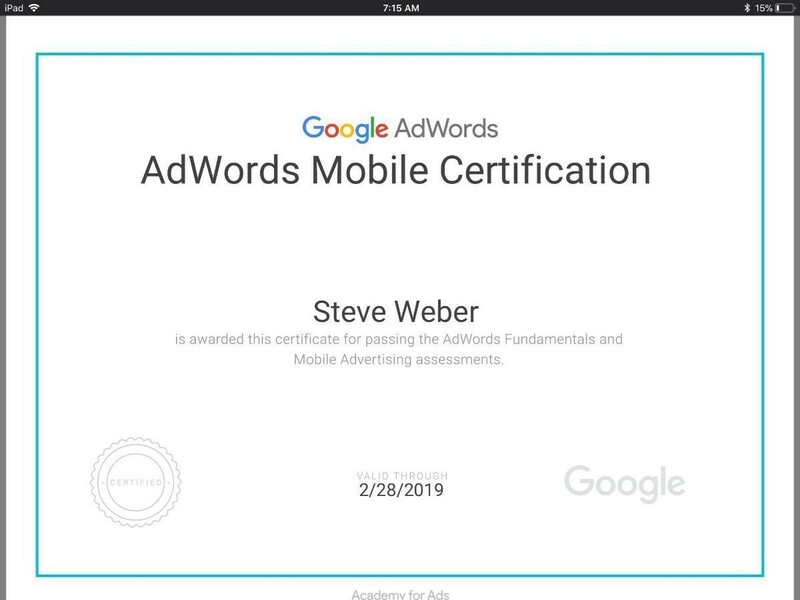 This week was a quicker course on mobile from the Google Academy for Ads. The course covers the benefits of both mobile sites and apps and where they can fit into your mobile strategy. This is a very quick course that would fit well in your quest while you work on some of the longer, more difficult, exams. You can take this for free here. This week was all about getting better at sales. It is one thing to be a very disciplined marketer and another if you are, a marketer with a very strong sales toolkit. 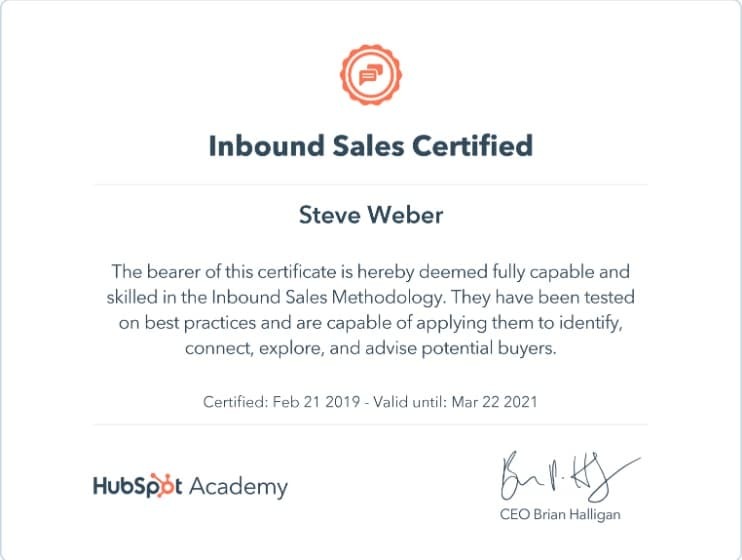 Fortunately for me, Hubspot has the Hubspot Inbound Sales certification course. This course is for great for anyone for tips they can use in their next sales call. The course is a foundational level course that will help you identify new prospects, connect with them, explore their needs, and advise them on a path forward. You can earn this certification for free here. This was another renewal. This one is the staple for paid search marketers. It is the fundamentals course and exam for Google Ads (Adwords). 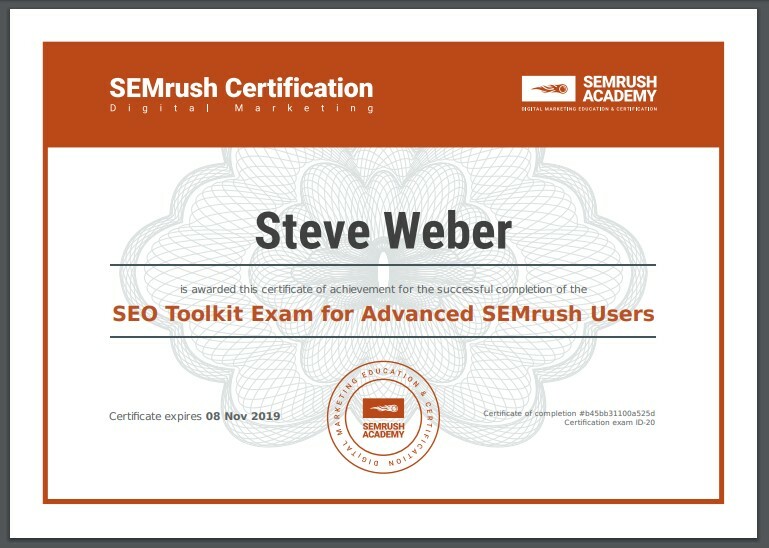 While this is a paid search certification, I feel it is a vital exam for SEOs to earn too. 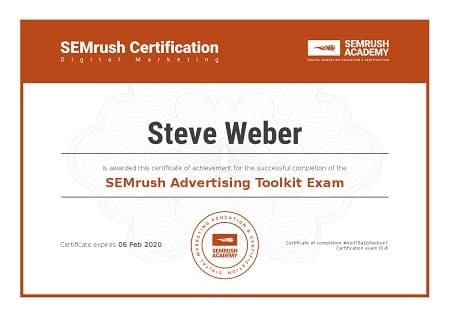 This was a renewal for SEMrush’s Advertising Toolkit certification. This one is the certification for all of the advertising features for SEMrush. SEMrush is my go to digital marketing tool for SEO. I often have to remind myself it has a brilliant wealth of data on the paid search side too. Maintaining this certification is about reminding myself we have more tools than we can ever need, we just need to use them. 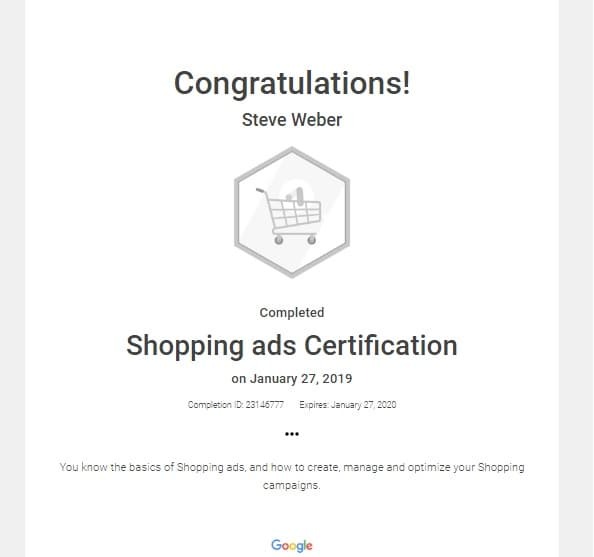 This was a renewal for my Google Shopping ads certification from last year. Not much has changed from this test from year to year, however, I have also been using shopping campaigns more than ever. The best advice I have is that if you are an ecommerce search marketer of any kind, you really should get this certificate. This was another renewal from an SEMrush certificate from last year. 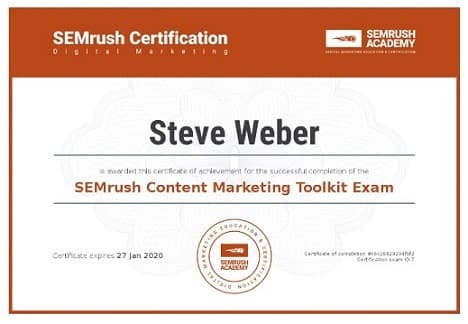 This was the SEMrush Content Marketing Toolkit exam. This is their certification on using the features of their software that would aid in content creation. As you’ll see from other certificates, I view SEMrush as my digital marketing swiss army knife, so I highly recommend this one. This was a renewal for the SEMrush SEO toolkit exam from last year. This is their certification on using the SEO features in their software. I see SEMrush as my digital marketing swiss-army knife, so I highly recommend this one. This course has no certification at the end of it, however, it is still worth going through it. 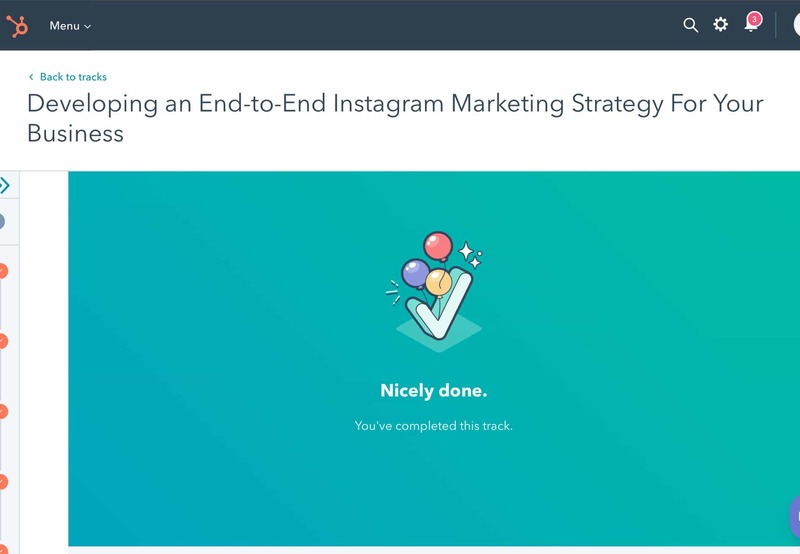 This is an Instagram marketing course that will give you the foundation you need to manage it for yourself or clients. If you’re interested in social media, check this one out too. This certification is for advertisers who want an edge over their competition. SEMrush is what I consider to be the swiss army knife of digital marketing. This is their PPC fundamentals course. I recommend this for anyone who is doing any form of SEM. This certification is for agency owners who want to put an emphasis on growth for their clients. I liked this one because it challenged me to think differently about what would happen if I reworked my digital marketing clients to be centered around growth rather than certain deliverables. The truth is that I get hired to make things happen, and going about that does not look identical from site to site. This course helps you understand everything you will need to make the shift to being growth driven. I recommend this one for my agency and consulting friends. This week was spent taking a course that is all about creating campaigns and experiences online that are growth driven. The school of thought behind this is that it is better to get a quick first version of a site out and spend more time making small incremental improvements to it based on what the data tells you than to take forever launching the perfect site. This course alone has gotten me to rethink how I put together strategies for the sites that I work on. Launch and adjust is better than guess, launch, measure, report and wish the conversion rate was better. I liked this one and think you will too. Here we are one year later and there is still no shortage of digital marketing content to help us become stronger in our craft. 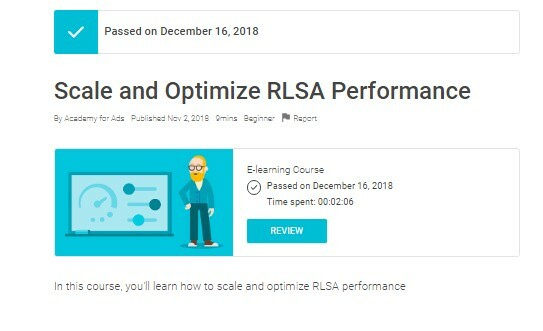 For this week I wanted to learn more about some of the new Google retargeting strategies, so I took the Scale and Optimize RLSA Performance course on the Google Academy for ads. The course was helpful. It even lit a fire under me to begin using Google Analytics to create a few new retargeting audiences. It is the 52nd week of our weekly certification quest. 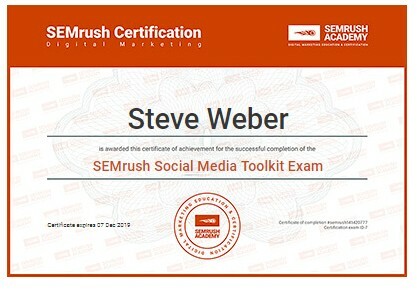 This week was Semrush’s “Social Toolkit” certification course. This course covers Social Strategy in general and how you can use SEMrush’s social tools to help manage your social presence. Stay the course and keep learning, Friends! It is the 51st week of our weekly certification quest. 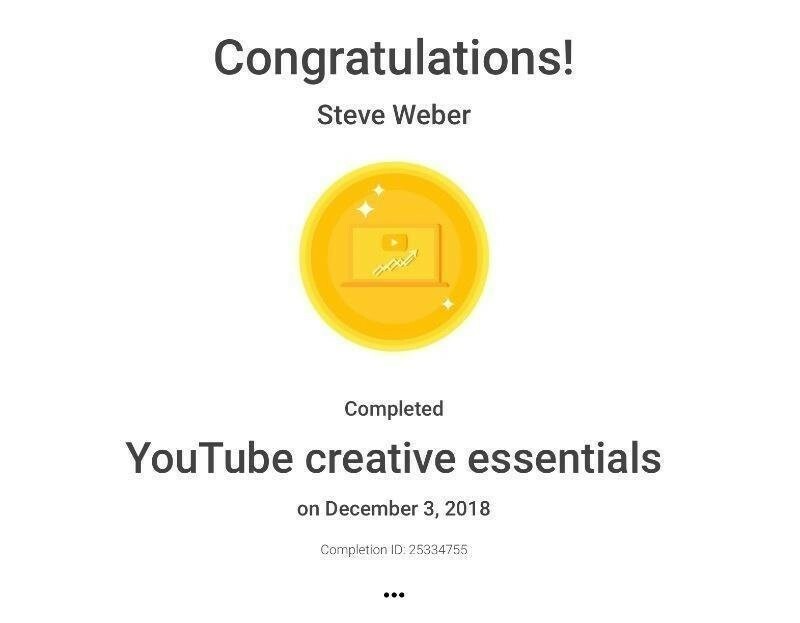 This week was Google’s “YouTube Creative Essentials” course. This course covers Youtube creative strategies for video marketing. It goes over what works and what does not work. By 2025, half of U.S. viewers under 32 will not subscribe to a pay TV service. The is another course about being on the right side of history. We’ve got to keep pushing. We’ve got to keep learning, Friends! It is the 50th week of our weekly certification quest. 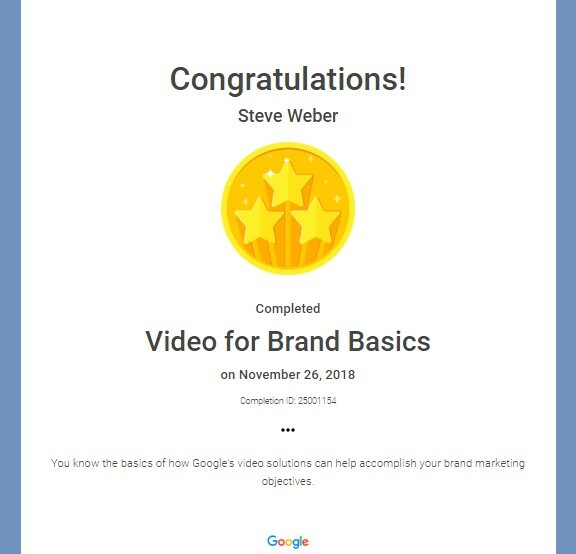 This week was Google’s “Video for Brand Basics” course. This is an introductory course that covers Youtube and marketing with video. By 2025, half of U.S. viewers under 32 will not subscribe to a pay TV service. The course is about building your brand with video now so that you’re on the right side of history. Let discipline and learning be your advantage! It is the 49th week of our weekly certification quest. 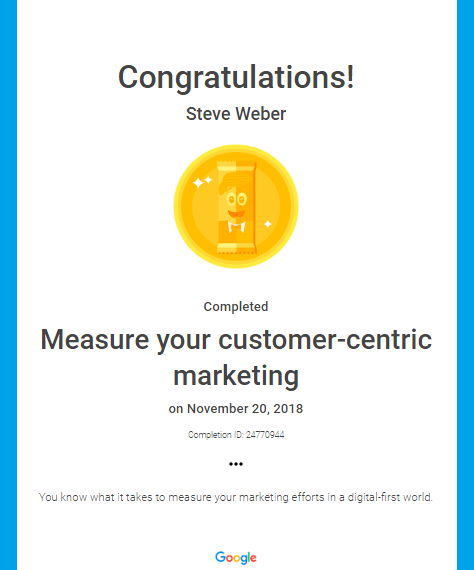 This week was Google’s “Measure your customer-centric marketing” course. This course will help you anticipate differences between the traditional and digital worlds and offers tips to ensure effective measurement of your campaigns. Instead of focusing on isolated transactions, this course helps you understand how to better attract and retain customers who will bring your brand the most value in the years to come. This one is worth checking out. Let’s keep this momentum going, Friends! It is the 48th week of our weekly certification quest. 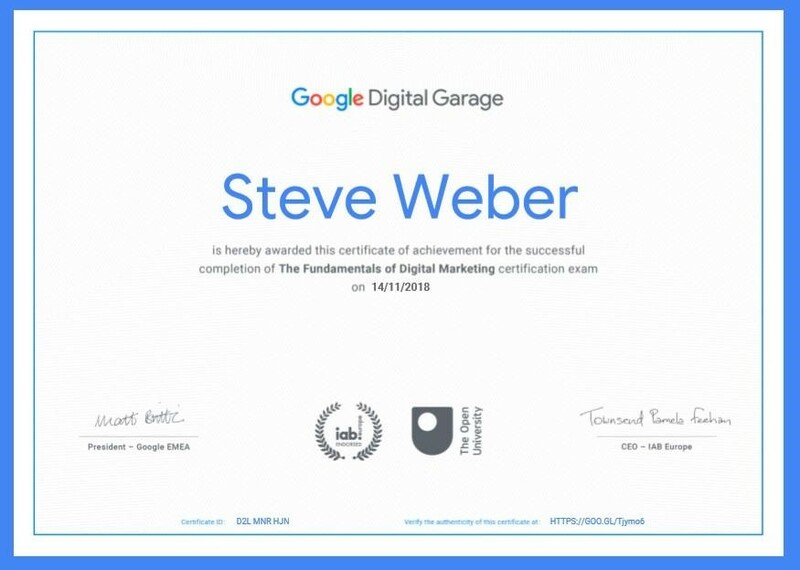 This week was the new Google Digital Garage foundations of Digital Marketing certification course. This course was on the longer side, however, it was totally worth it. It is a foundational level course for all things digital marketing. It is up to date, and you will finish this course having a grasp on what it is like to be a digital marketer. You also get this neat looking certification once you make it through it. Let’s keep learning, Friends! It is the 47th week of our weekly certification quest. This week we focused on the “SEO Toolkit for Advanced SEMrush Users” from the SEMrush Academy. This is a free exam for SEMrush users who are looking to sharpen their mastery of the tools. Remember to challenge yourself, friends! It is the 46th week of our weekly certification quest. This week we focused on HubSpot Academy‘s Business Writing course lead by Daniel Pink. Yes, that’s the best selling author Daniel Pink. This was a fun course where Daniel shared his top writing tips for researching, outlining, and editing his work. Anyone can benefit from the tips shared in this course. I recommend this one. Let’s keep learning and stay sharp, friends. It is the 45th week of our weekly certification quest. 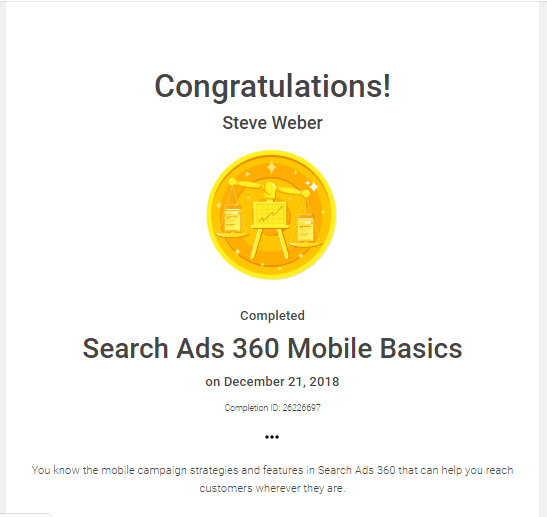 For this week we focused on Google’s Search Ads 360 basics course from the Academy for Ads. This course will teach you how to set up your first ad campaign, manage your budgets, and measure your ads performance. It is not an in-depth overview, however, it is enough to get started. If you’re looking for a basic ads course, you might want to check this one out. We got to keep our discipline and stay sharp, friends! It is the 44th week of our weekly certification quest. 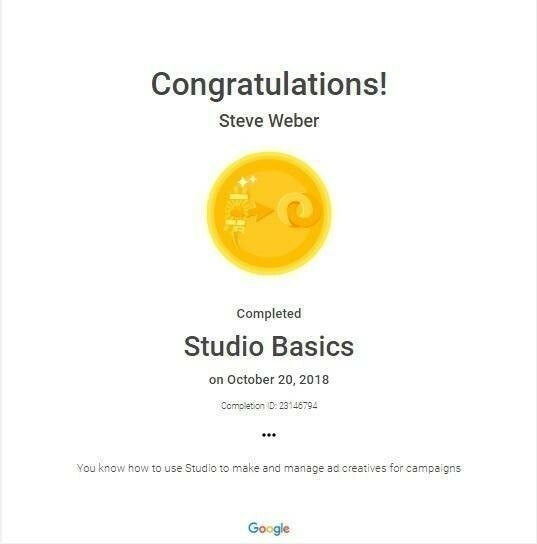 This week’s course was Google’s Studio Basics from the Academy for Ads. 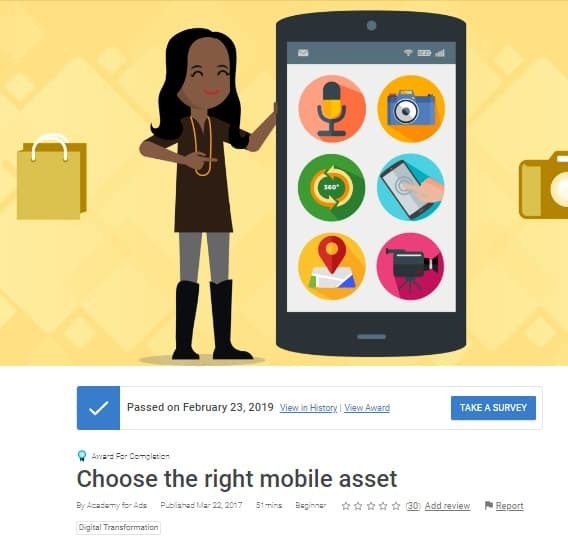 Google Studio is a tool to simplify the creative development of rich media display ads. This course covers enough of the basics so that you could begin to make rich media ads on your own. If you’re interested in graphic design or display marketing, you might want to check this one out. Keep that momentum, friends! It is the 43rd week of our weekly certification quest. I am learning that there is no shortage of free certification learning material online. Lately, I’ve been working on the PPC side and helping a teammate strategize his budget for Amazon’s Sponsored Product Ads. To get up to speed, I’ve been making my way through the learning material that Amazon provides in its Seller Central portal. In Seller Central’s learning section, there are a few benchmark quizzes that you can take to test your understanding. This one is all about product quality and what you can list vs. not list on Amazon. We’ve made it to week 42 of the #certquest! This week was Google‘s Performance 2018 course. This is a quick course to get up to speed on the latest ad products and changes from Google. This covers some of the new automated bid types and ways to target users across all devices. Google is constantly changing, so I recommend adding this one into your quest. It is the 41st week of our #certquest! Let’s keep it going! This week’s course was the Alison Diploma in E-Business. This is a general diploma covering e-commerce, SEO, PPC, and Analytics. It is worth noting that this is one course that I do not recommend. The course is out of date, and if you would like to learn more about any of the topics covered, you should earn one of Google’s official certifications. Let’s keep the momentum going, friends! It is the 39th week of our certification quest. This is a brand new Google Analytics Academy course. It is called Google Analytics for Power Users, and it is all about turning your insights into action. I recommend this one for anyone who uses Google Analytics on a regular basis. Our certification quest continues on for its 38th week! This week’s certification course was the new SEMrush Technical SEO Course and Certificate. This course is great for anyone who wants to learn more about the technical side of SEO. It will teach you technical SEO concepts so you can avoid any potential issues and learn how to leverage your technical ranking opportunities. I often find that websites don’t rank as well as they should due to a simple technical reason, so I recommend this course for anyone with an interest in SEO. It is week 37 of this certification quest! 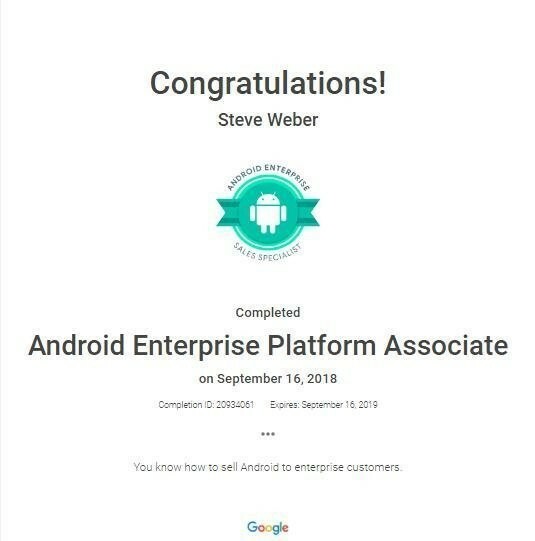 Please know that as I went to type, “and still going strong,” I was really thinking to myself, “I can’t quit now.” This week’s course was Google’s Android Enterprise Platform Associate certification. It is designed to teach you about the value of Android and walk you through examples of where it can fit into your business process. 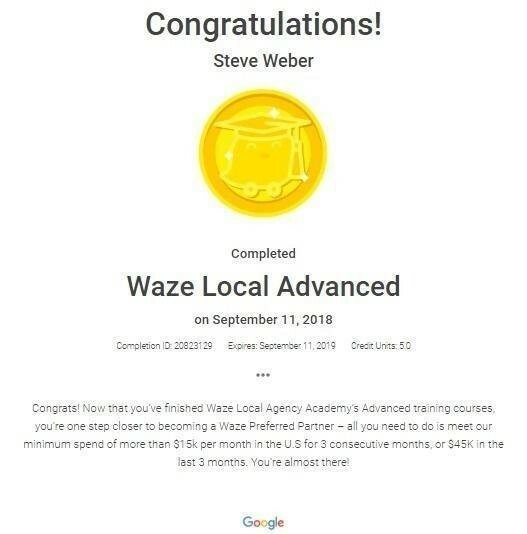 Week 36: Google’s Waze Ads Local Advanced course This is the second, more advanced, Waze ads course. This course will teach you how to optimize your Waze Local campaigns and dashboards. There is even a section to help with pitching Waze local to clients. This is the 35th week of our #certquest! Let’s keep this going! 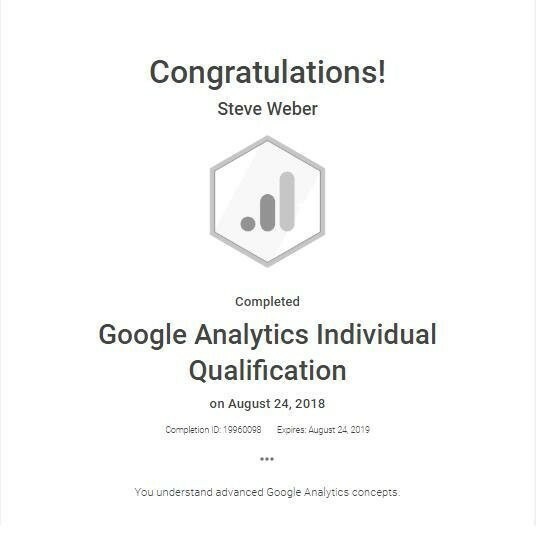 This week’s course was my #localmarketing 7th renewal of the Google Analytics Individual Qualification. This is actually the first digital marketing certification that I have ever earned. If you’re wondering where to begin with your certification quest, this is it! Measurement is so vital to the success of your marketing efforts. Being that Google Analytics is free and most likely installed the majority of website’s you will work with, it is a platform you will want to master. This course is where you can begin that journey. The #certquest continues with week 34! 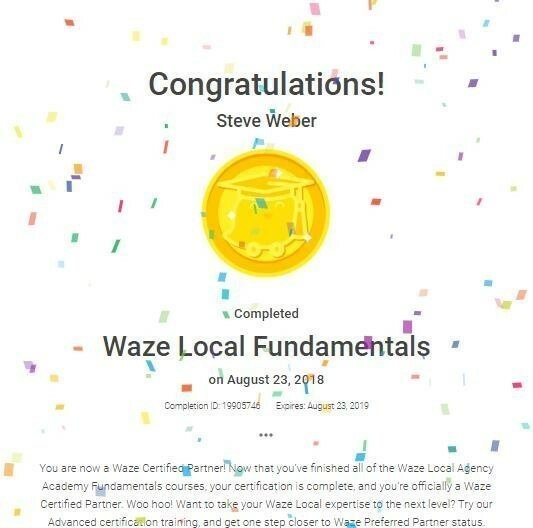 This week’s certification was Google’s Waze Ads Fundamentals. Yep, there is a certification for Waze! The course covers the Waze Local ad formats and how to track the performance of your campaign. It is the 33rd week of the #certquest! 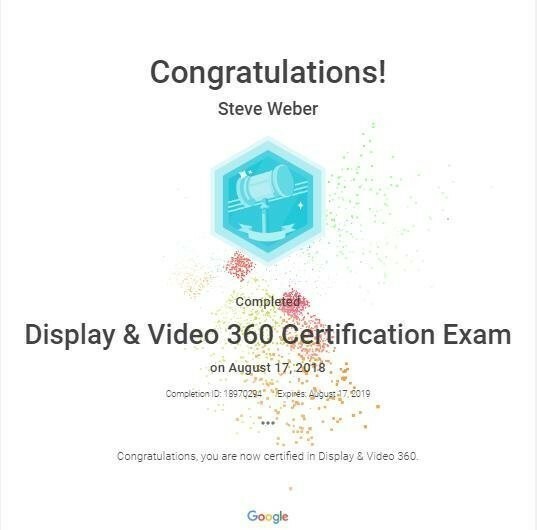 This week’s course was Google’s Display and Video 360 certification. 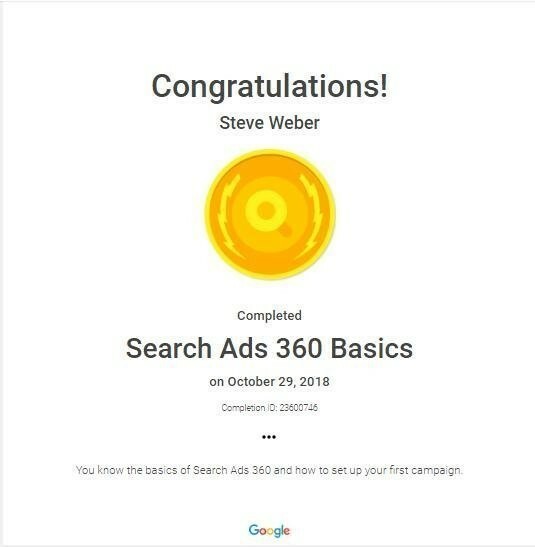 D&V 360 is the new branded Google platform that blends features from DoubleClick Bid Manager, Campaign Manager, Studio and Audience Center to a single hub, and this is the certification exam for it. The exam covers campaign setup, assigning inventory, goals, budgets, targeting, and creatives. 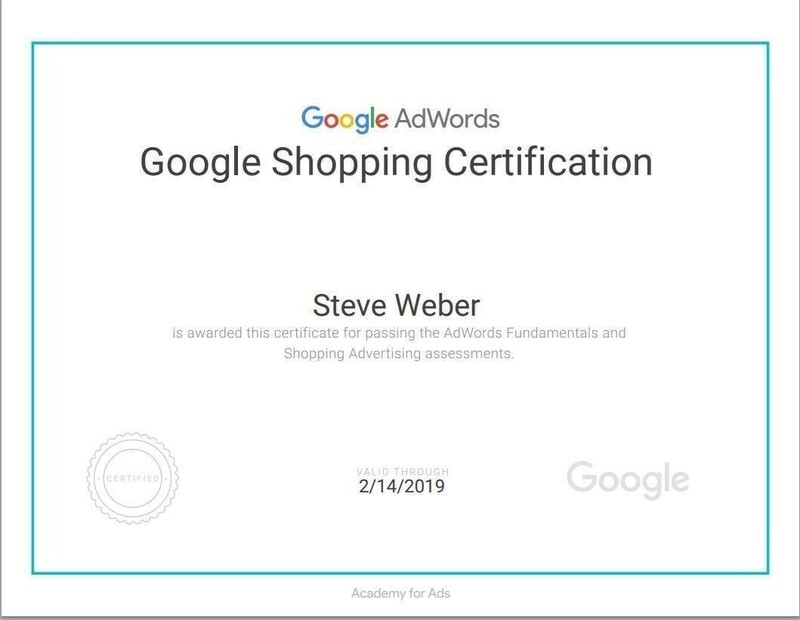 This is another new certification course for Google, so all of my display marketing friends should check this one out. The #certquest continues with week 32! 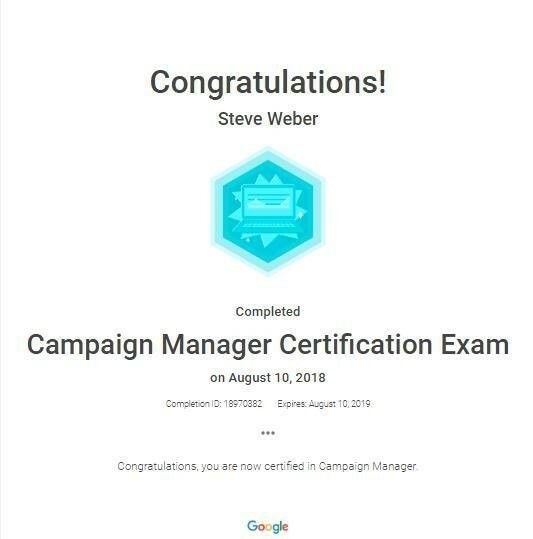 This week’s certification was Google’s Campaign Manager certification. The Campaign Manager exam covers planning, implementing, and reporting inside the Campaign Manager. 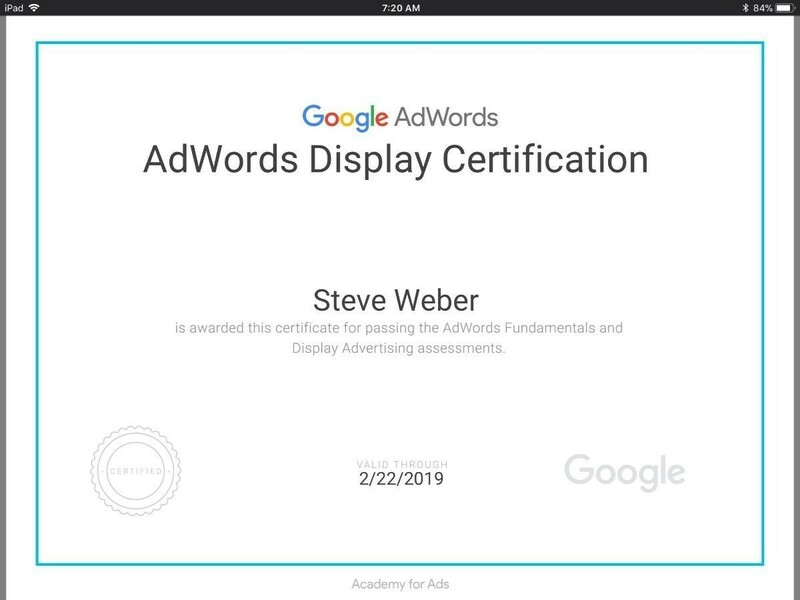 This is a new certification course for Google, so all of my display marketing friends should check this one out. Week 31 of the #certquest was all about Video Marketing. 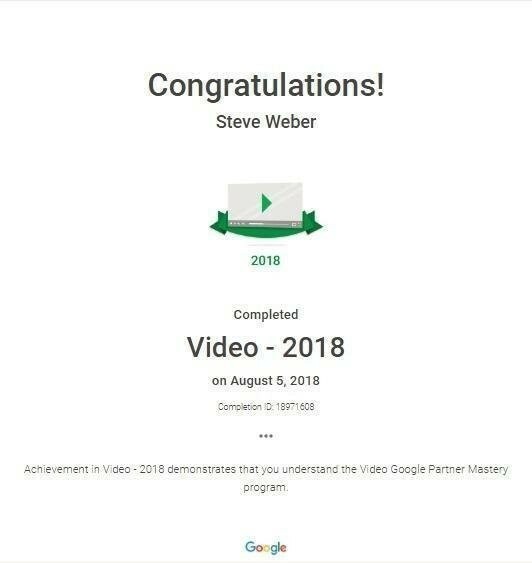 This week’s course was Google’s Video 2018 certification. This will teach you about the latest video ad formats, how to target your audience, and how to measure your efforts. It is a quicker course to go through, and it will get you up to speed for all things video in 2018. It is already the 30th week of our #certquest! Let’s keep this going! The rules of this quest are simple. Every week keep your career sword sharp by taking a course or earning a certification related to your field. 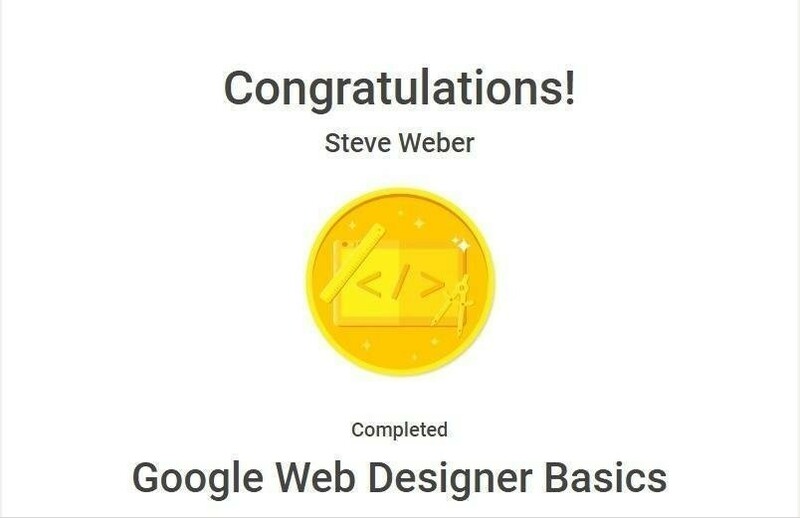 This week’s course Google Web Designer Basics. Google Web Designer is a free HTML5 creation tool that helps beginners make engaging creative for banner ads. It allows you to easily create engaging ads without the need to use a developer. This course covers enough of the basics for you to get started using the tool to create ads. It is week 29 of our #certquest! Each week we are earning or renewing a marketing certification. This week was about sharpening my Google Analytics sword. 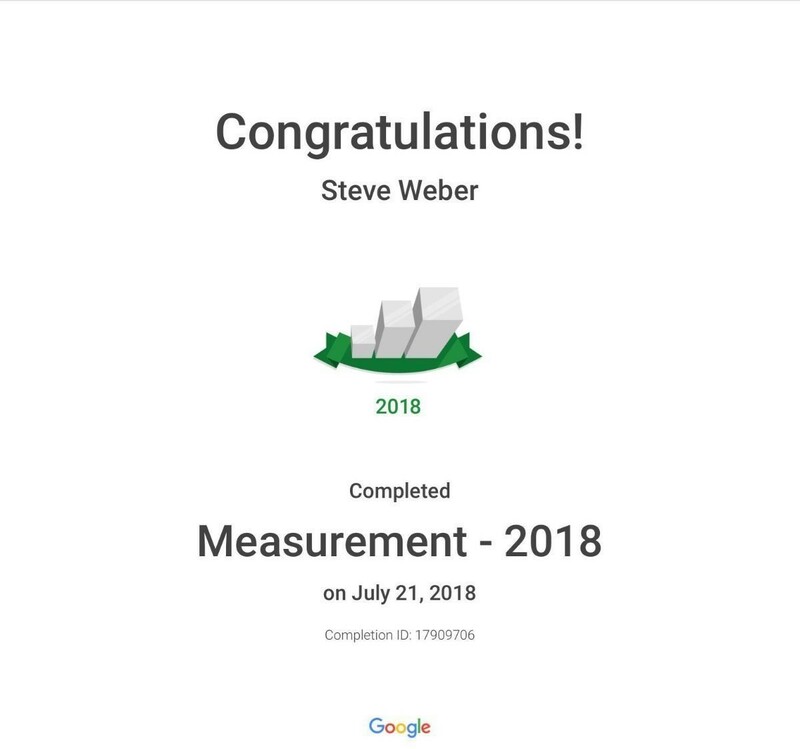 I made it through the Google Measurement 2018 course. This will show you the latest ways of using data to make intelligent marketing decisions. Basically, the course covers attribution and the various ways to gain insights about your audience. It is week 28 of the #certquest! It has been incredible to get tagged in your weekly accomplishments too! This is about sharpening our swords, so let’s win together. 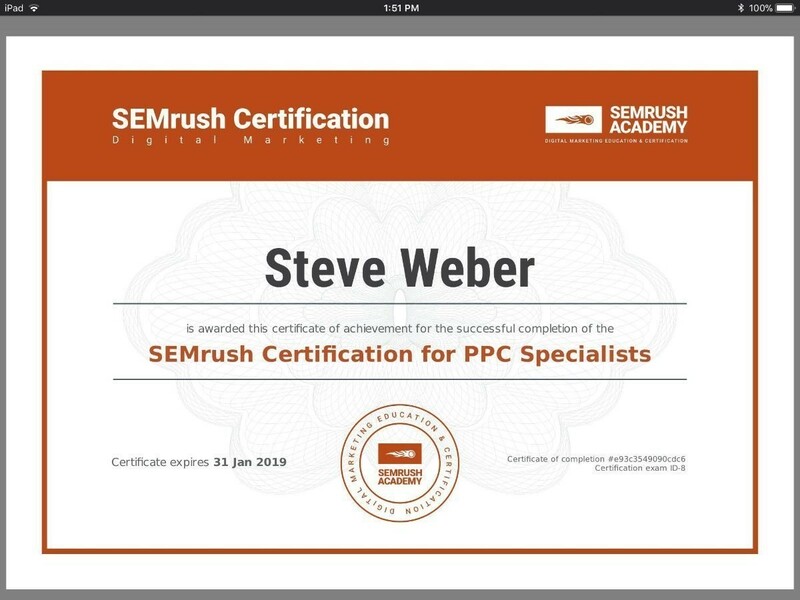 This week I refreshed the SEMrush for PPC specialists course. There is a wealth of knowledge found inside monitoring your competitors’ ads in SEMrush. This week was all about tapping into that mindset. This course reminds me to leverage my competition’s strengths and devoting energy to the areas where they are weak. It is already week 27 of this quest! Join me in this quest by going through a free online course this week. Keep the sword of your skill set as sharp as it can be, friends! 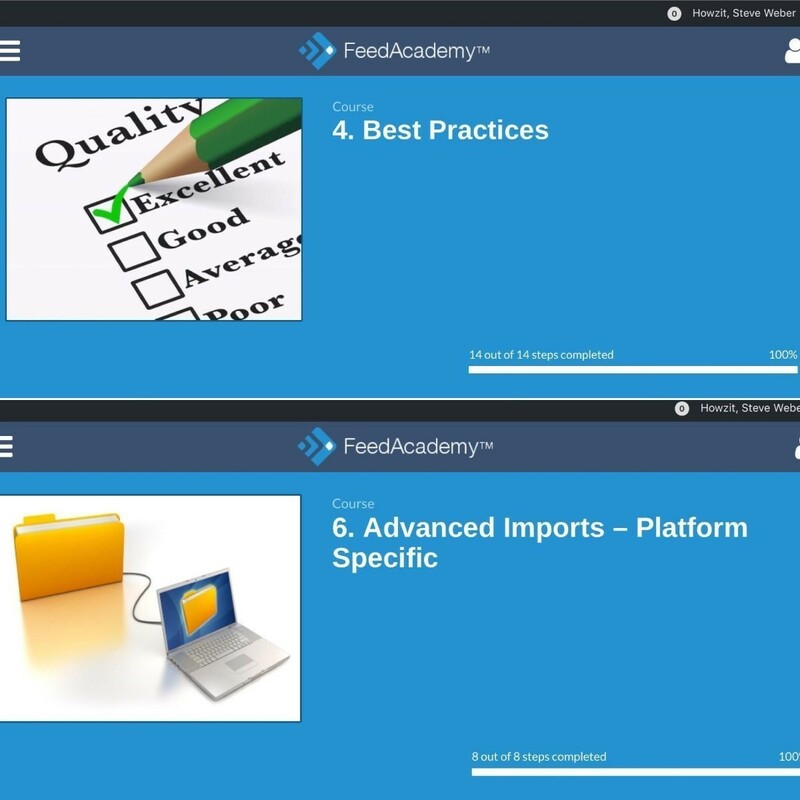 This week I dove back into my Google merchant center roots by completing two Feedacademy.net courses. This the educational portal for the data feed management software Feedonomics. Week 26 of the certification quest was all about Google local results. 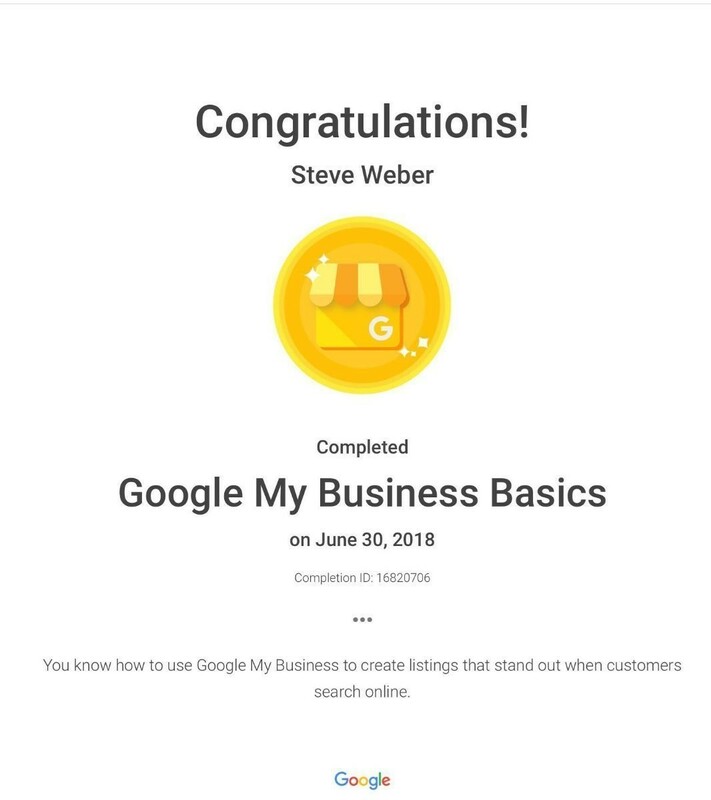 This week we conquered the Google My Business basics cert. This course is an easier course for your quest. This will teach you about the latest Google My Business features and how you should use them to attract local customers. If you have a business that you would like its local listing (or Google Maps listing) to rank higher in search results, then check this one out. It is the 25th week of our certification quest! 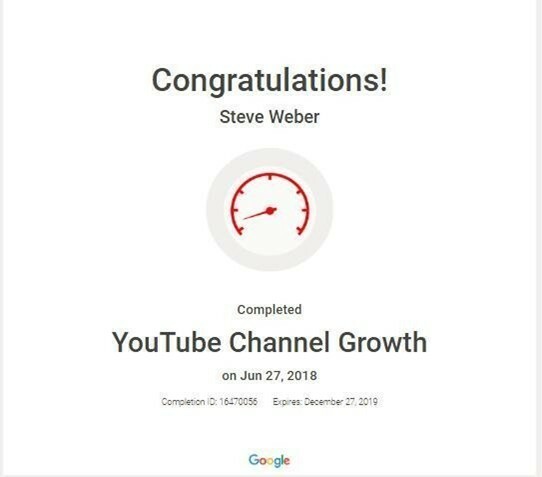 This week we powered through the YouTube channel growth cert. This YouTube marketing course teaches how you can grow your YouTube channel. The course covers best practices, video strategy, and assessing /analyzing how a channel can fit into different content categories. It is worth checking out if you are running a Youtube channel or thinking of launching one. It is the 24th week of our certification quest! This week we conquered SEMrush‘s 2018 SEO Fundamentals Course with Greg Gifford. This course is an up to date foundational SEO course. If you were ever wondering, “isn’t there one resource that is up to date and teaches both technical and content-based SEO?” Yes, this is that course. This is great for anyone who wants to learn more about search engine optimization. It is also great for well versed SEOs who want to quickly get up to date with 2018 best practices. 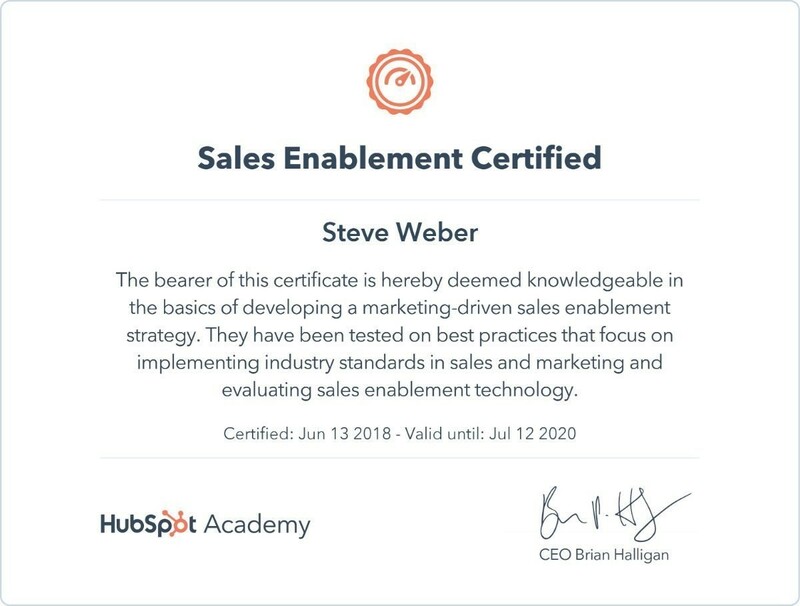 HubSpot Academy Sales Enablement Certification = Conquered It’s the 23rd week of our certification quest! This course is great for understanding how marketers and sales professionals could work better together. The course will teach you methods for aligning both sales and marketing to create buyer-centric content. I would recommend this course to anyone who would like to get an edge when it comes to sales or their inbound marketing strategy. The saga continues for our 22nd week! 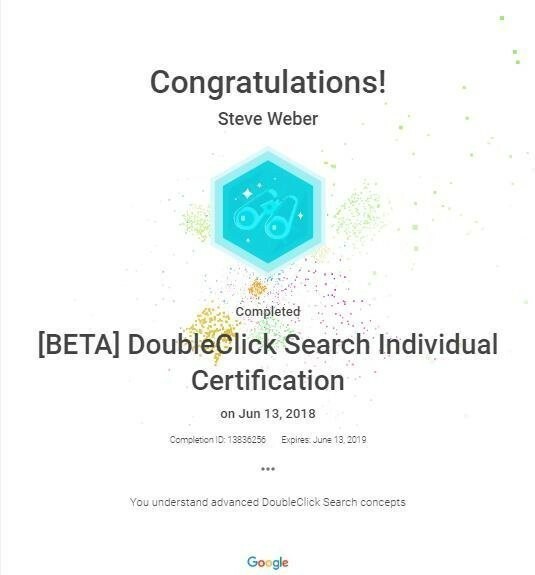 This week’s certification course is a new Google beta exam for DoubleClick Search. There are a few new DoubleClick certifications that I’ll do my best to review over the next coming weeks. This course is great for any Paid Search marketers interested in learning about how DoubleClick can help elevate their strategies. This course covers automation, bid strategy types, floodlight variables, merging offline with online conversion and what felt like everything in between. Being that this course is still in its beta stages, I felt this one was more challenging than most of the other exams on the Academy for Ads portal. I say that because I am not 100% sure that every question I was asked during the exam was actually covered in the prep material. That said, it took me an extra two attempts to pass this exam. With every attempt, my score seemed to get a little better until I passed. I would recommend giving yourself an extra 2-3 hours of study time due to the gaps in prep material. Each week I am earning or renewing a digital marketing certification. Join me in the quest by earning one of these free certs too! Good luck in your quest, friends! It is week 21 of our weekly certification quest! This week’s course is near and dear to my heart because it’s an SEO training course! 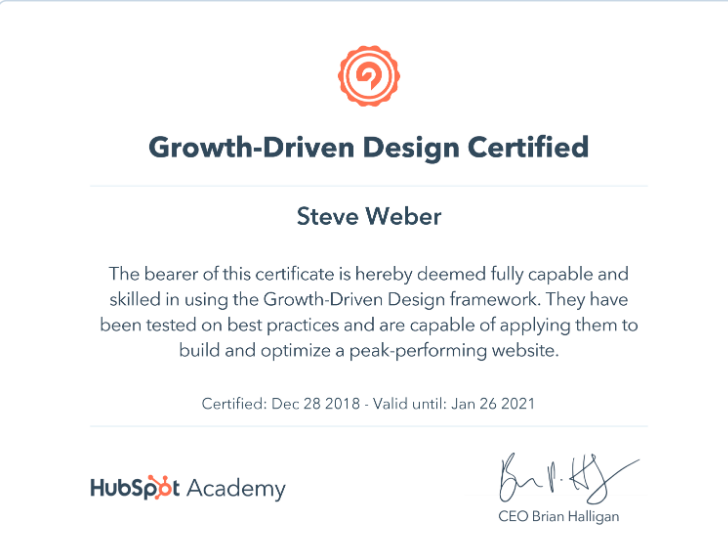 For week 21 we made it through HubSpot Academy‘s 2018 SEO Training Course. 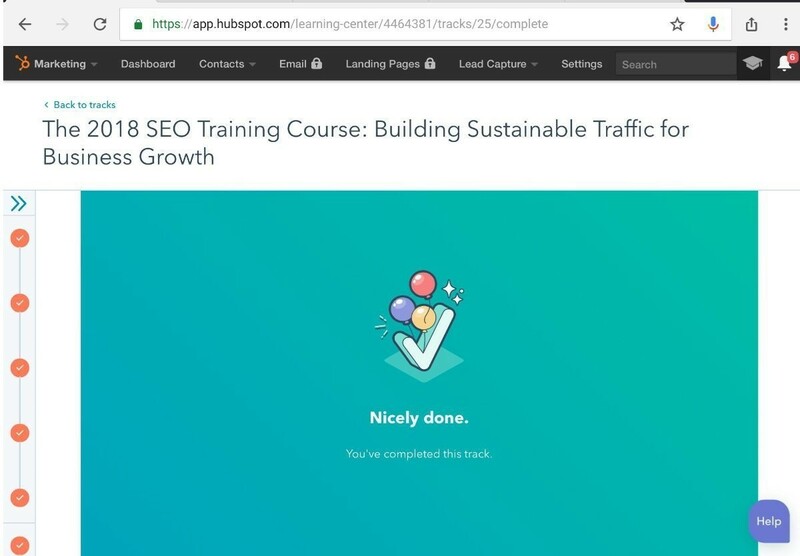 If you’re interested in SEO and want to learn how to get organic traffic in the latest ranking algorithms, then check out this course. I highly recommend this one as there are not many up to date resources to learn SEO from. This will give you a solid foundation to learn from. While I focus on SEO professionally, even I learned a few new strategies which I am excited to deploy. It is week 20 of our certification quest! 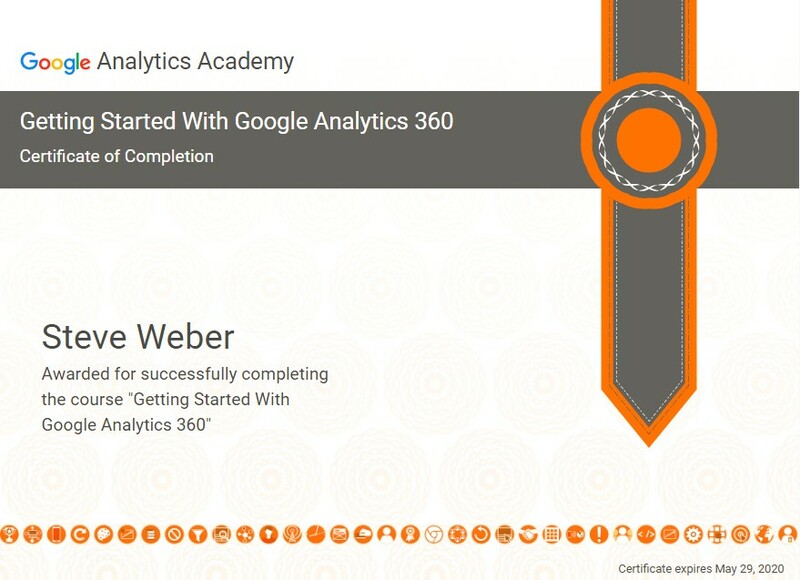 This week’s course was the Google Analytics Academy “Getting Started With Google Analytics 360” certification. I recommend this course to any online marketer or analytics wizard who might be interested in learning more about the benefits of Google Analytics 360. GA 360 has a few key features which are not available in the standard free GA suite. If you are involved in any form of online marketing for an enterprise brand or large website, check out this course because there is a good chance you’ll encounter GA 360 sooner than later. The course will walk you through the additional features of roll-up reporting, custom funnels, and unsampled data. Additionally, the course will cover GA 360’s seamless integration with each of the Doubleclick platforms and BigQuery. The course is a great introduction to learning about why you might want to begin using GA360. It is week 19 of our weekly certification quest! This week has been fun with some career change announcements share! I began a new role as the SEO, SEM, and Data Analytics expert for World Wide Stereo! I am now client side and remaining close to agency life by consulting after hours. The new role requires that I stay sharp on my Google Tag Manager (GTM) skills, so renewing my GTM cert felt like the way to go this week. 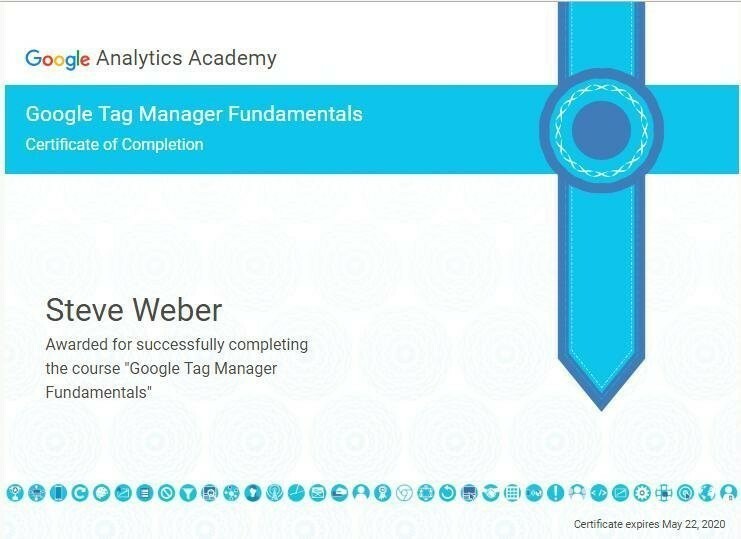 This week’s certification was Google Analytics Academy Google Tag Manager Fundamentals certification. I recommend this course to any online marketer, web developer, or anyone interested in learning more about the basics of Google tag manager. The course will walk you through the basics with simple examples and video training. It will help you get your hands dirty enough to feel confident using GTM, building tags, using triggers and migrating existing tags into your new container. The whole idea of GTM is based on simplicity, so if GTM is not a tool in your marketing kit, take this course. It is week 18 of our certification quest together! This week has been one gigantic reminder to just keep moving forward! 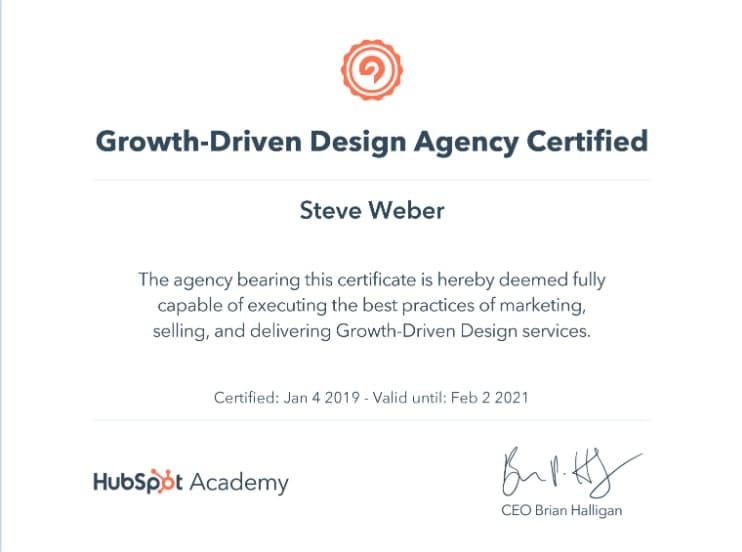 This week’s certification was the HubSpot Academy Contextual Marketing course. This was a new course for me. I wound up making it through all of the material and still failing the exam twice before passing it with only one point to spare! 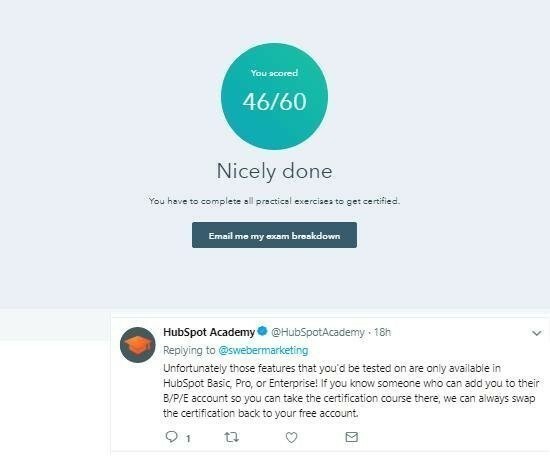 After passing the exam, I’ve come to learn that I will not be awarded the certification because there is an extra graded feature that is accessible only for Hubspot paying users. With this course being technically free and the certification itself requiring you to pay, you might only want to consider this course if you are already a Hubspot user. This detail is not disclosed anywhere in the prep material of the course. In the meantime, the important part is not the piece of paper saying that we passed; it is who we become while we are on our quest! Our progress continues with week 17 of our certification quest! 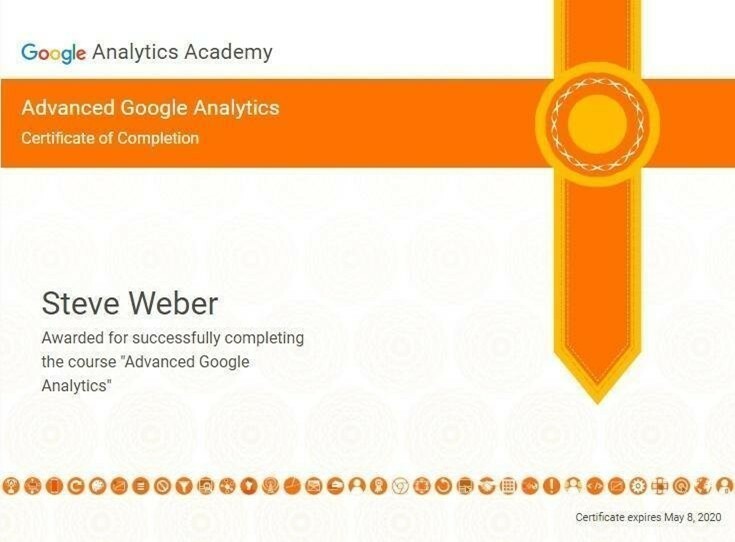 This is Google’s Advanced Analytics certification from their Google Analytics Academy program. This is a short four module course to help sharpen your Google Analytics sword. This certification is great for anyone who would like to learn more about the advanced features of Google Analytics. 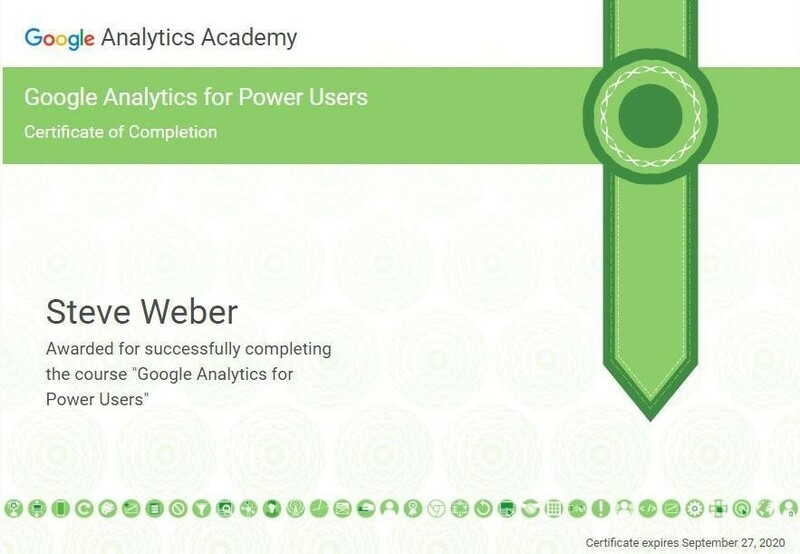 I recommend taking this course before beginning the larger Google.com/partners Google Analytics certification course. It is week 16 of our certification quest together! A few of you have approached me about this whole “sharpening your sword” kick, and I am thrilled it is serving you well too! Your discipline is what will set you apart, so please keep going with it! This is the Google Mobile Sites certification. This was a renewal for me. All of the Google certifications expire, so we need to renew them each year. It is just more fuel for our quest. 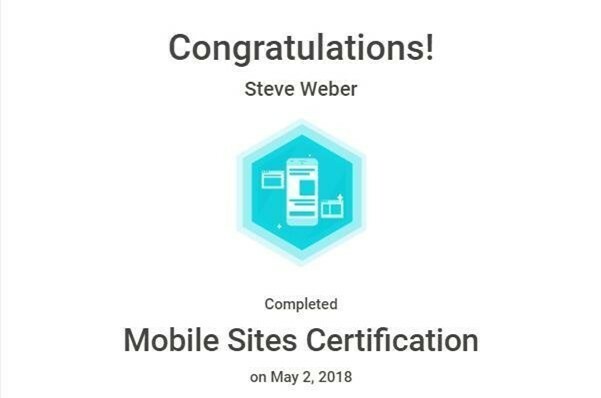 About this free cert: This certification is great for any webmaster or SEO who wants to understand more about creating a solid mobile user experience online. This course is one of the more relevant courses for an SEO. It will give you a foundational understanding about everything you will need to do in order to optimize your mobile user experience. One of the best career tricks I’ve learned over the years is to recognize the powerful combination of discipline and the compound effect. This is the 15th week of the certification quest we’ve been on together! The goal here is to convey that there is no barrier to keeping your sword as sharp as possible! In my field, there is a small collection of certification courses and 90% of them are completely free. There are likely small barriers to entry that would make you a qualified juggernaut in your field too. The real trick is to chunk the lofty goal down into bite-sized weekly chunks and force yourself to see it through. What barriers are there in your field? You got this, friends! 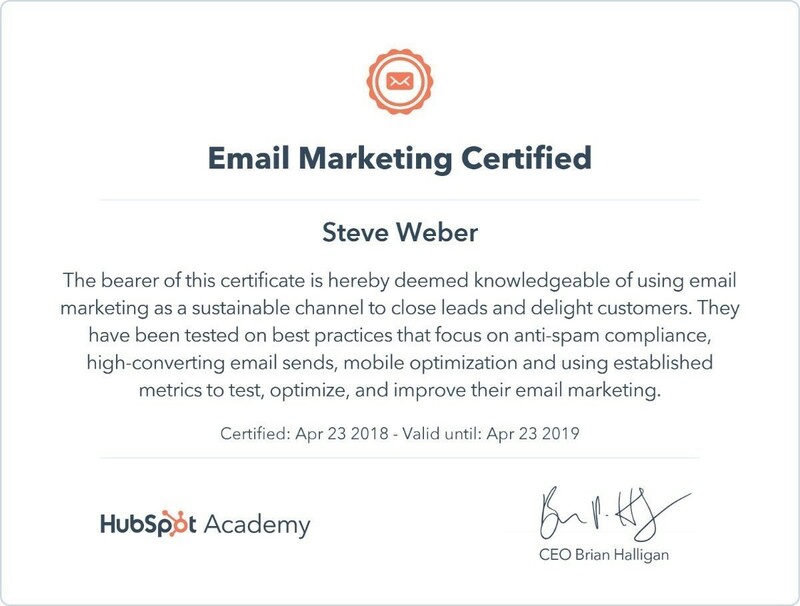 Here is all the info about this certificate: This is the HubSpot Email marketing cert. This cert is excellent for anyone who wants a better understanding of how to shape their email strategy. It covers the tried and true email best practices while maintaining its customer-centric focus. These lessons come from a welcome “surprise and delight” place which other email marketing courses seem to overlook. Here is to weekly progress! Thanks for your support of this certification quest! This is the 14th week of the certification quest we’ve been on together! The goal here is to convey that there is likely no barrier to keeping our swords as sharp as possible! So let’s do this! 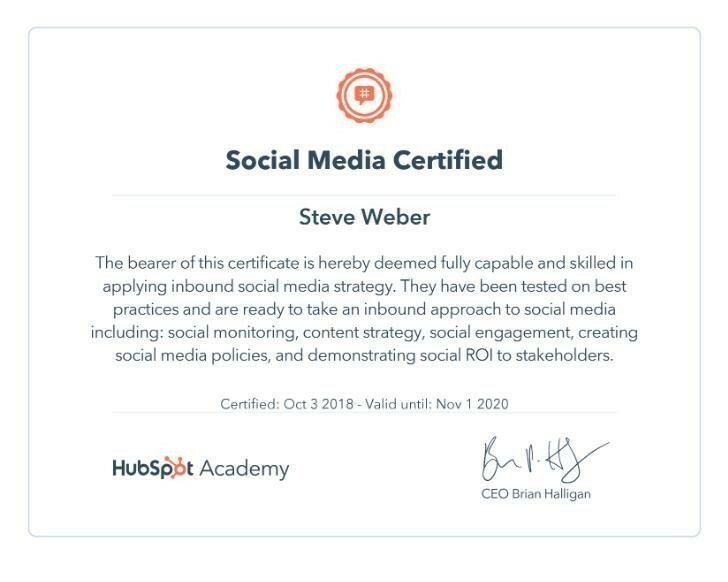 About this cert: This is the HubSpot Inbound marketing cert. 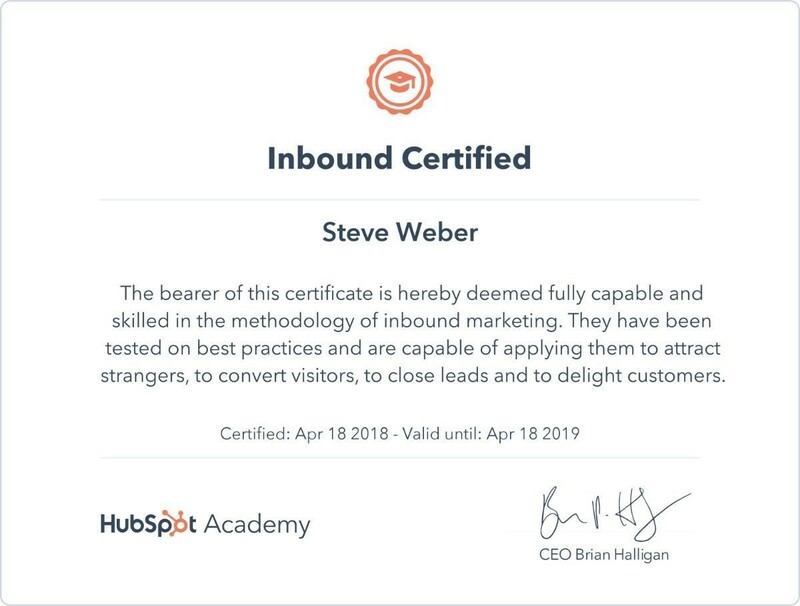 This certification is free, and it is excellent for any marketers who want a better understanding of how to shape their inbound strategy. The course covers everything from identifying your buyer personas to delighting customers at all stages of their journey. It is a customer-centric course that would benefit any marketer or webmaster. This is the 13th week of the certification quest we’ve been on together A new week and new chance to sharpen that marketing sword! Our cert quest continues! 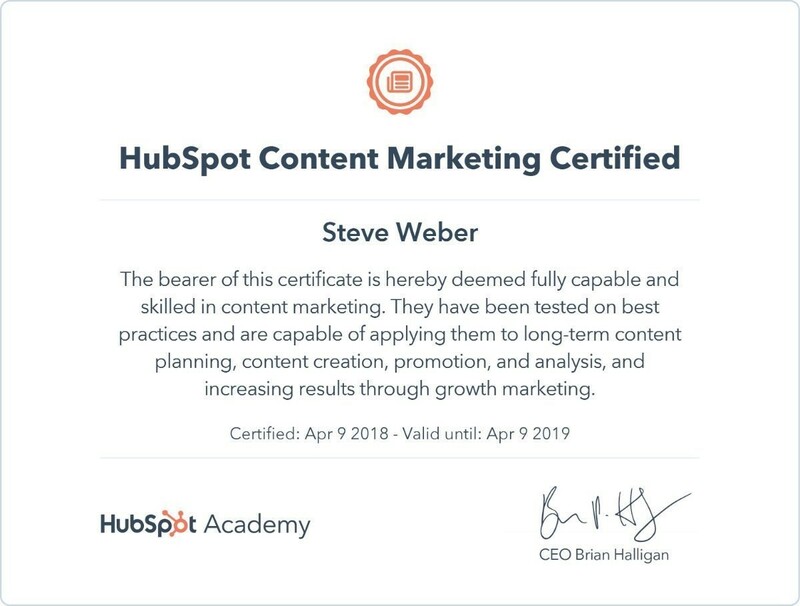 This is the HubSpot content marketing cert. 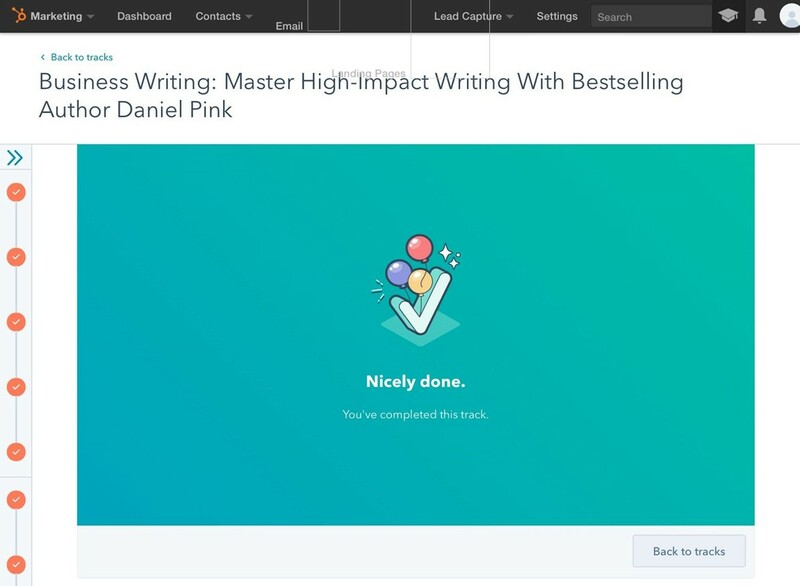 This certification course is excellent for any anyone who wants to be more effective with the content they create online. I recommend this course to anyone who wants to create meaningful content online. The lessons will teach you strategies that leverage the needs of your audience while simultaneously accomplishing your marketing objectives. Our progress continues for the 12th week! 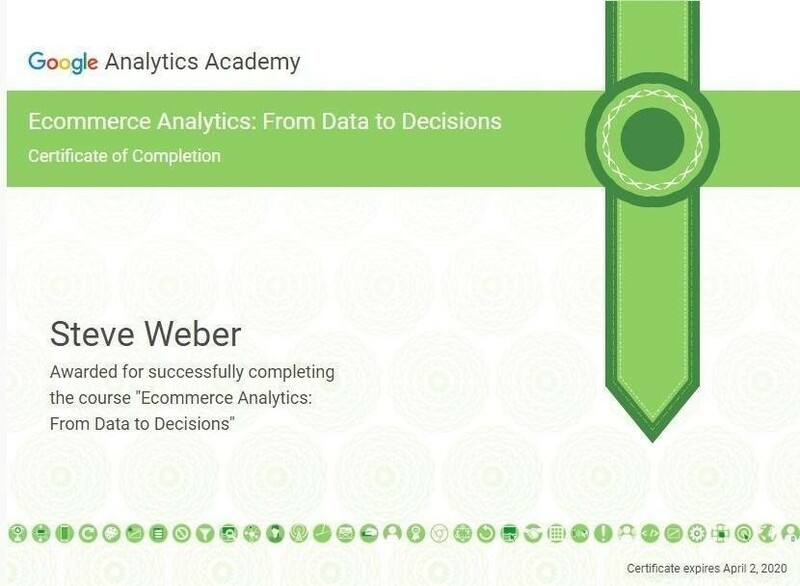 This week the certification quest continues on with the Ecommerce Analytics cert from the Google Analytics Academy. This certification is excellent for any Ecommerce marketers interested in leveling up their Google Analytics analysis skills. Week 10 Our discipline is still the name of the game here! The certification quest continues with the Microsoft Bing Ads course! About the cert: This is the paid search certification course for anyone who is interested in pay per click advertising on Bing. Each week I am earning or renewing a digital marketing certification. Join me in the quest by earning one of these free certs too! Week 9 – Here is to keeping our skillset swords sharp! The certification quest continues on for another week! This course is great for anyone interested in advertising on YouTube. YouTube offers some really neat ad types where you pay only if a viewer chooses to watch or engage with your ad. This course is free and relatively simple to conquer. With most of us watching YouTube videos on nearly every device we own, this certification makes complete sense to earn for anyone interested in marketing online. Week 8 – The cert quest continues! Join me in the quest of sharpening our marketing swords by earning or renewing your certs! In each of these posts, I’ll do my best to include all of the information you will need to earn the certification too. 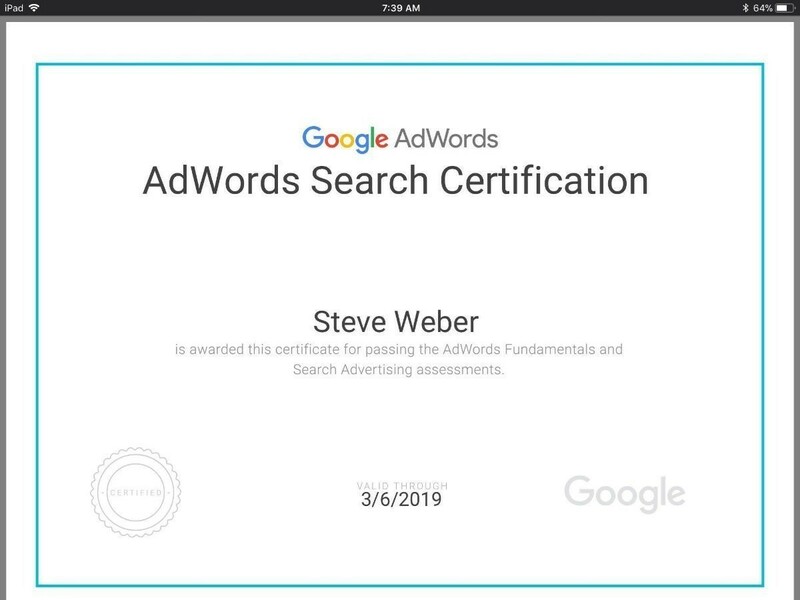 This one is the Adwords Search certification course. This is the next course after the Adwords Fundamentals exam. 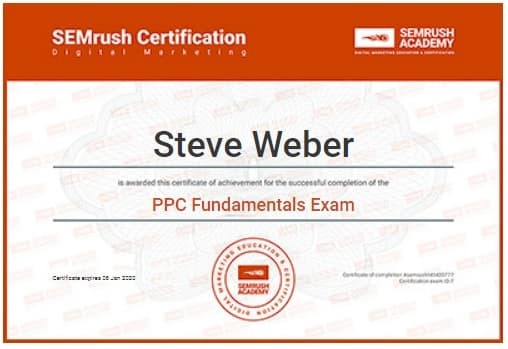 It is the quintessential paid search marketing exam as completing this would qualify you as being “Adwords certified.” Being that it gives you a foundation for search marketing, I recommend this cert for digital marketers of all types. This exam is 100 questions at an immediate level. 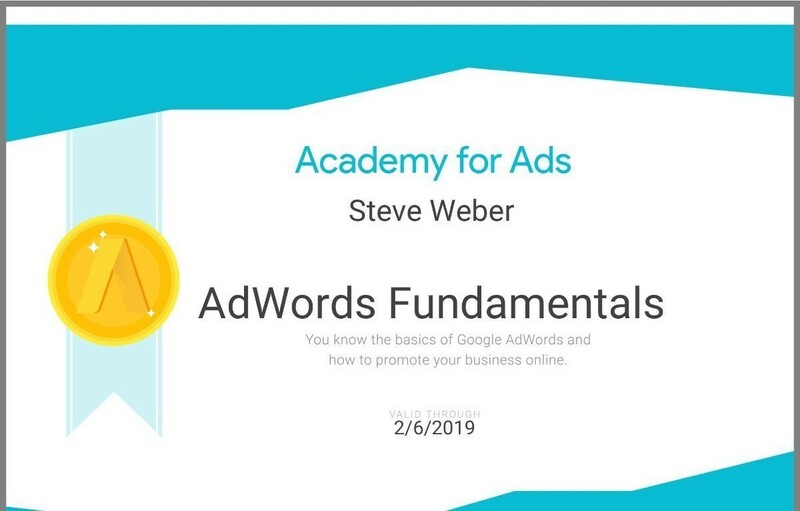 I would say if you use Adwords regularly, you would have no problems earning this cert. Even if you have very little hands-on experience with Adwords, you could still pass this exam with 2-3 hours of the pre-exam tutorial exercises. Week 7 – Here is to momentum for all of us! Another week another step forward in the cert quest! Earlier this morning I passed the Google Adwords Mobile Ad cert. This free certificate course is perfect for anyone interested in advertising in Google’s mobile results. With all of us using our phones as our primary source for navigating the web, online advertising is changing. This course will help you understand some of the new machine learning targeting types available as well as understanding where mobile devices fit into the online buyer’s journey. If this sounds interesting, I recommend you join me in the cert quest and get this one! Week 6 – The cert quest continues! I seriously encourage you to join me in the quest as all of these certifications are free. Sharpen that marketing sword, friends! This is the Google display marketing certification. This covers some of the new automatic bid types available to Google paid search and its display network partners. This certification course is great for anyone interested in generating buzz about their business online. Week 5 – Here is to another productive week and the cert quest continuing! This is the Google cert devoted to all things product ads. This certificate is excellent for anyone interested in marketing an e-commerce website. With several ads above the organic results for all commercial keywords, this is also great for our organic brothers and sisters too. Week 4 – We are still keeping the certification conquest going, friends! 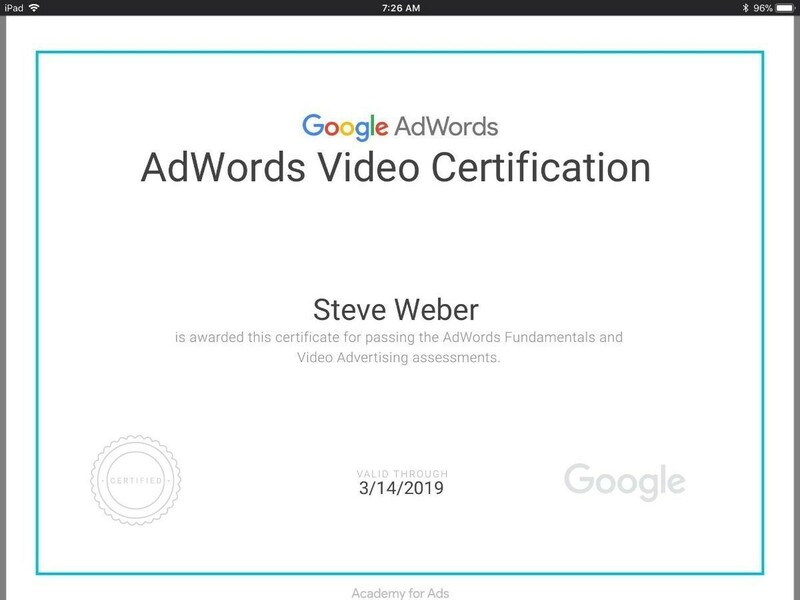 This is the first of at least two Google certifications you’ll need to become AdWords certified. This is the staple cert for anyone interested in paid search advertising on Google. It is completely free for you to get, so join me in the cert quest and earn it! Week 3 – Round 3/3 – We’re still keeping that momentum going! 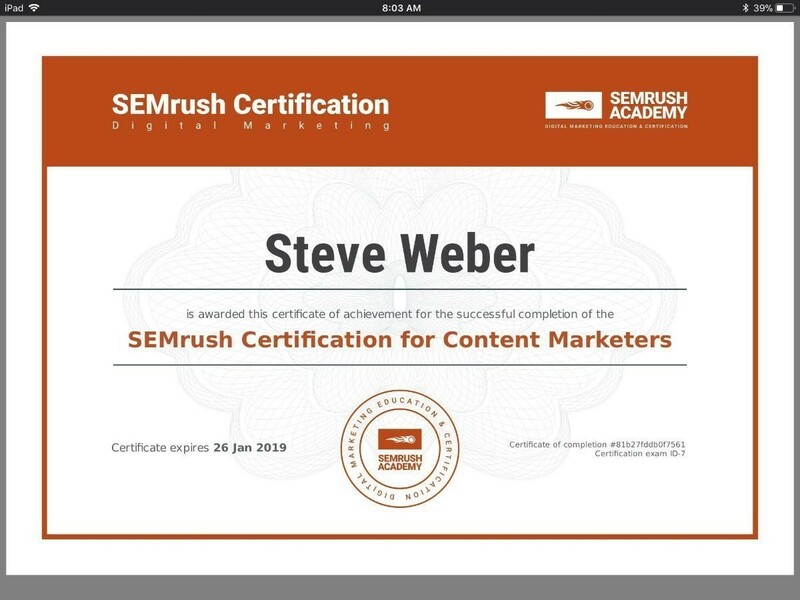 This is the third and final certification from SEMrush. 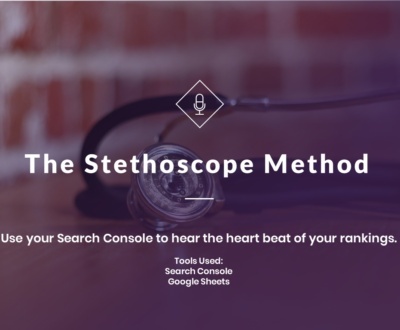 This one is great for anyone interested in paid search. Now go conquer all three of these certifications and sharpen your marketing swords, friends! Week 2 – Round 2 of 3 = Conquered! Here is to another productive week. This is another SEMrush certificate you should earn. This one is excellent for anyone focused on content creation. Go get it, friends! Week 1 – Here is to kicking off Thursday in a productive way! Semrush has a new certificate you should go conquer! Here is what I learned after earning a digital marketing certification every week for a year. For the past year, I have been on a certification quest of earning one new certification per week. If you follow me on LinkedIn or Twitter, you’re likely sick of seeing my #certquest posts by now. I am going to continue sharing my progress each week. Along the way it has been fuel for some social posts, however, I am really just doing this to make sure I remain disciplined, educated, and hungry within my field of search engine marketing. When I began this I was thinking to myself, “this is great for getting social engagement!” At first, sure it was. By week 15 or 16 my followers quickly learned that I was going to do one post like this every week and seemed to be less inclined to “like” my progress. That said, this isn’t about them. It’s about you and I. It’s about the people who want to be the best in their field and they understand that being the best takes work that compounds over time to make them the best. So for me, I am going to keep going. Ultimately it comes down to the type of marketing you’re doing now or hope to be doing in the future. With being primarily an SEO, I used to think some of the Google display certifications exams to pass. It was completely not the case. None of the digital marketing certification exams, or any exam I’ve taken over the past year, was that difficult. The more exams you pass from the same source, the more you will understand their ultimate goal with the type of marketing you are attempting to become certified in. All of the tests are multiple choice and they follow the typical two are options are obviously weak answers and two are potential correct answers. The goal is to identify the answer that is most likely correct. If you take a step back and ask yourself, “of these two answers which would make for a better user experience?” then you will likely get the correct answer. These certifications are all free. If you fail you can take these again either immediately or after a few hours. The stakes are insanely low and the benefit here is that you will potentially learn something new that could make you a stronger marketer. This is more about who you’ll become along the way than to have an exact schedule. Everyone learns differently, and I’ve been marketing online for the past 12 years. I have exposure to many of the systems, strategies, and marketing types I was learning about. Above all else, I believe it is more important to learn and retain information than to simply earn a useless certificate. This is a reminder that little habits done wins consistently over time can compound into profoundly positive change. Good luck in your quest, Friends! Steve Weber has been marketing online since 2005. He has managed SEO programs for Calvin Klein, Reef, Jansport, Nature Made, Fanatics, and many (many) more other brands ranging across all sizes and verticals. Steve was a licensed stockbroker who has adapted his learning of portfolio theory into an effective approach to search engine optimization. Steve’s SEO strategies emphasize focus, priority, and discipline in a manner that will take your organic traffic levels to new heights. Steve is currently maintaining 25 digital marketing certifications and on a weekly quest to conquer new ones. When he is not optimizing the web, Steve is a musician, marathon runner, and board sports enthusiast.